When we cancel Worship Services it is because conditions in the building, parking lot or the roads present significant challenges to operating practically and safely. You can always check our Facebook Page* for cancellation notices as well as our website*. We will also send Cancellation notices by email to our Wednesday Connections @ Good Sam email list. Cancellation decisions will be made by 8 pm Saturday Night if we are going to cancel Worship Services for the next day. I wish to say a special thank you to one of our Good Sam Neighbors. You might have seen Starr around Good Sam. She is a member of St. Mary’s Small Business Partners, that meets at Good Sam on Thursday mornings. Starr has one daughter and is raising two of her nephews. 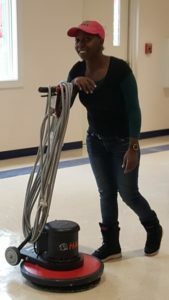 Starr is the owner of Top Notch Everything and her company does everything from clearing services to sorting and packing personal property and disposing of clutter and unwanted items. I first met Starr over a conversation about how much our Fellowship Hall floors need clearing and waxing not to mention regular attention. Since then, I have learned what a caring and positive minded person she is. It sure is a blessing to meet and come to know and care about such quality people in our community. On occasion, Starr visits the Prayer, Praise and Promise in Christ Church that worships in the Good Sam Sanctuary on Sunday afternoons. 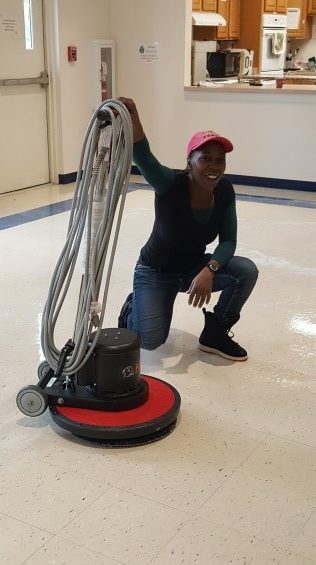 Recently Starr and I were having that conversation about the Fellowship Hall floors again and the next thing I knew, she had scheduled a cleaning time and is contributing her time and effort to support our ministry in the community. We give thanks for you Starr Gladden and we give thanks for your big heart and for the blessing of having you in our circle of friends and in our community. Our Grapevine publication is taking a new format and function in our congregational life. Beginning early this month you will see a monthly publication of congregational news that we will call “The Grapevine.” It will be available at church on each Sunday of the month and anytime the office is open. In addition, you can find the The Grapevine published on our website. You can also find The Grapevine each week through a link provided in our Wednesday news email called Community Connections or “Connections” for short. On Sunday mornings at Good Sam you will also find a Sunday news page that will give information about that particular Sunday. So you can find out what classes are offered that Sunday and what time Sunday School starts. What is the theme for Worship today? All these things and more will fill our Sunday publication called Good Sam Today. Good Sam Today – Sunday News for each individual Sunday, handed out as you enter worship. The Grapevine – Monthly Good Sam News printed and available at church as well as published on our website and available all month. The last page of the Grapevine will have a calendar of activities including each Good Sam community activity we know about. Connections – a Wednesday email publication with news, reminders of upcoming activities and events, links to larger news articles in the Grapevine and sent our as blog posts on our Website and over email. Our Website – (GoodSam.Community) Ministry news, blog posts, highlights of Good Sam activities, staff and council pages, program and campaign news and much more. Good Sam News can be found on our website in two forms. You can find a PDF of our monthly newsletter (The Grapevine) as well as blog posts of particular events, activities or human interest stories about life and ministry in the Good Sam Community. As many of you know, Anita Goehringer (Pannone) has been writing and editing news, Sunday publications and blog articles at Good Sam for many years. Her creative and faithful efforts have been an ongoing blessing throughout her time working in Communications as part-time staff at Good Sam. Anita Stepped down last month to pursue new and additional interests in her life with us at Good Sam as well as outside the congregation. Thank you Anita! We have included the full article about her transition below for your information. What this means for us in the office is that we will be absorbing as much of her work as we can among our staff and volunteers we currently have. This means that we will need help in writing and developing articles about life and ministry at Good Sam. Can you help? Do you like to write? Would you and others you know like to learn more about our ministry efforts and what some of our individuals and groups at Good Sam are doing that has great impact in our community? We need you to help us identify and write these news articles. Please let Pastor Mitch, Iman Syler or Kelly Thurber know of you interest. Prayer: Shine into our hearts the light of your wisdom, O God, and open our minds to the knowledge of your word, that in all things we may think and act according to your good will and may live continually in the light of your Son, Jesus Christ, who lives and reigns with you and the Holy Spirit, one God, now and forever. Amen. The sermon begins after the last carol “Of the Father’s Love Begotten”. Prayer: Almighty God, you made this holy night shine with the brightness of the true Light. 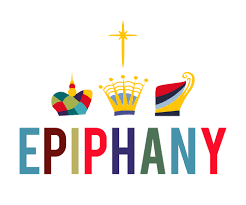 Grant that here on earth we may walk in the light of Jesus’ presence and in the last day wake to the brightness of his glory; through your Son, Jesus Christ our Lord, who lives and reigns with you and the Holy Spirit, one God, now and forever. Amen. Prayer: Stir up your power, Lord Christ, and come. With your abundant grace and might, free us from the sin that binds us, that we may receive you in joy and serve you always, for you live and reign with the Father and the Holy Spirit, one God, now and forever. Amen.